Ayala Nivin with her youngest child. 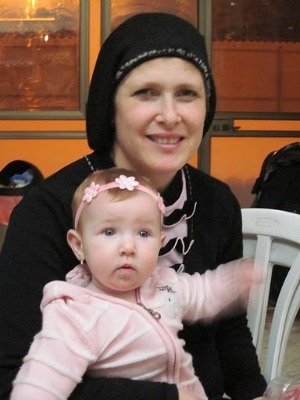 Ayala Nivin is the mother of 14 children (KA”H!) whom I recently wrote about for the article “Cleaning for Passover Under Fire” about getting ready for Pesach in Ashdod. But I only actually met Ayala in person at her son’s bar mitzvah this month (Ayala’s husband is my teacher, Rabbi Aryeh Nivin). What really blew me away, right away, about Ayala was how relaxed and genuinely cheerful she seemed despite all the stress of being in the middle of her son’s bar mitzvah and having many, many small kids underfoot (the Nivins have 5 children under the age of 4 and a half, including a set of 3-year-old twins). As a child I used to fantasize about having a big family, and as I grew a bit older I was anxious that I might not be able to have children. So when I discovered that I was pregnant for the first time, I was in Heaven. But I didn’t think about having another child right away. Having a big family wasn’t something that I planned on, but it turned out that that was Hashem’s plan for us. I think that almost every woman has a deep instinctual need to give to a child. And I’ve always felt that need as well. Because of that, I guess, having a large family just feels natural to me. I also feel like it’s a huge zechus. I feel very, very lucky. My husband and I both lost family members in the Shoah. My great-grandparents were murdered by the Nazis and my husband’s father and uncle were the lone survivors of their entire extended family. For that reason, my husband also views having many children and raising them to continue in Hashem’s ways to be one of his primary missions in life. He believes, as I do, that this is the best way to rebuild the Jewish people after the murder of 6 million Jews during the Holocaust. My husband always explains that a Jewish child is the most valuable thing in the world, so that by having many children, he is just being a “very smart businessman.” I guess you could say that we feel like billionaires. So it feels a bit strange when people who aren’t religious see me and how hard I have to work as the mother of 14, and they give me looks as though they are saying, “You poor thing!” They think that having many children is something low or primitive. Or they’re wondering, “Doesn’t she want to have a career instead?” And you know why they look at me this way? Because they respect a person who has an advanced degree or is a workaholic, but they don’t understand that bringing these holy souls into the world and raising them to be good Jews is one of the greatest achievements possible for a human being. It’s true that as a mother of many children, my personal needs often get pushed aside. It is a huge challenge staying on top of all the extra clutter and the mess, not to mention all the extra cooking and cleaning that having a large family requires. It’s often very difficult. But as my children grow, I definitely see the payback from Hashem for all of this hard work. I see my children growing older and becoming real mensches. And this year we are even hoping, G-d willing, to make our first wedding. I really want people to understand that the fact that I work so hard does not mean that I am suffering. Raising this family is the hardest thing I’ve ever done, but it’s also, without a doubt, my greatest source of satisfaction and pleasure in life. A few months ago I had a very special experience. My son really wanted me to make him a birthday cake for his class. It was hard for me to find the time to bake a cake, but I put in the extra effort and made my son a really yummy cake, since I knew it was very important to him. And when my son came home that day he went on and on about how it had been the best cake, and how all the boys had loved it, and that they hadn’t even left a single crumb. I understood that that was his way of saying “Thank You.” And that made me feel so grateful, to have a child who really goes so out of his way to make me happy. And there are so moments of nachas like that, especially now that my children are growing up. I feel like becoming a mother is like saying “Naaseh v’nishma” just like the Jewish people did during the giving of the Torah. The Jewish people said, “We will do and we will hear” which means they agreed to keep the Torah before they even knew what the Torah said. And that’s what a mother does as well. When a woman becomes pregnant, she accepts upon herself a commitment for an entire lifetime, raising a child she has never seen. This requires true self sacrifice and a tremendous leap of faith. But I feel that Hashem rewards me for this leap of faith. As a mother, I experience such tremendous Siata Dishmaya, such constant Divine Assistance and miracles. I feel like Hashem sees how much help I need to take care of all these children, and I feel like He gives it. Every single day. The other day, for example, my son forgot his lunch at home, so I had to bring it to his cheider. And even though I was in a big rush, for some reason I took a moment to write him a nice note to put in with his lunch. And when my son came home that day, I saw how his face was shining with joy, and I suddenly understood just how much that note had meant to him. I could see that Hashem had put that idea into my head so that I could give my child something that he, it turned out, really needed. And there are so many examples of that every week, experiences when I see with my own eyes how Hashem is guiding me and enabling me to care for my children. One of the most important things that enables me to manage this family is keeping clutter in my home to a minimum. And I have learned that my Olam Hamidos, my mind and heart, also needs to be free of emotional clutter to enable me to care for all these people who are depending on me 24/7. I don’t have room in my mind and heart for the clutter of petty concerns about what others will think of me or guilt or taking minor irritations or mishaps to heart. Let’s say, for example, that my two-year-old decides he doesn’t like the apple juice I made for him, and he spills it all over the floor. I do need to educate him that he shouldn’t do that again, but as my family grows, I understand that minor mishaps of this nature are not the end of the world! No matter what happens over the course of the day, I do my best to stay calm and keep my cool, and not to let myself get swept up by stressful situations. I know that when I’m calm I’m able to deal with whatever challenges come my way. The truth is that another real miracle that Hashem made for me is that I’m a much calmer mother today as the mother of 14 than I was as the mother of a smaller family. No doubt about it. I have days, and in fact I have many of them, when many things go wrong.. But I no longer allow myself to get bogged down in guilt like I used to. Not every day feels like a homerun. And that’s OK. I’m not perfect. I’m only human. I really had to work very hard on fulfilling this 2nd commandment since I suffered for many years from low self-esteem. When I was a younger mother, I felt like such a shmata, and I was so incredibly sensitive and my feelings were always getting hurt. But today, I see that when I feel like a queen, that light of royalty and malchus fills my home. When a mother feels like royalty, her kids feel like royalty too. Our family isn’t perfect. We have our issues, like all families. But I know today that when a mother feels like a queen, despite the inevitable mess and the stress of a growing family, then people will be able to see G-d’s greatness through her and through her home and her children. I personally feel very connected to the verse “Kavod Hashem Alayich Niglah” from Lecha Dodi, which means “G-d’s glory is revealed upon you.” And that is my ultimate goal as a mother. I pray that I will be able to serve Hashem with love, and to have a wonderful Jewish home, and to raise my kids to love the Torah so that Hashem will look at our family and say “G-d’s glory is revealed through you.” I pray that people will be able to look at my 12-year-old son, for example, and see the light of Kavod Hashem, G-d’s glory, shining through him. I feel sometimes like I am a security guard watching over a jewelry store. I am guarding these priceless treasures, these Jewish souls. And to be a trustworthy guard of such a priceless treasure I really have to take excellent care of myself and make sure that my needs are met on a spiritual, emotional, and physical level so that I can mother my children with joy. My children’s pricelessness also means that I have to guard them very carefully. I need to make sure that our home is a comfortable and positive place to be. I need to make sure that my kids are getting the education they need at school and at home. And I need to make sure that my kids will not be injured, G-d forbid, by the tests of this world. Another way I like to think of things is that our home is like Noah’s Ark. The flood is raging outside these 4 walls. But inside these walls, our home is a bastion of safety and security and holiness. I once heard a mother of twins say that have having twins is twice the work, and 100 times the nachas. 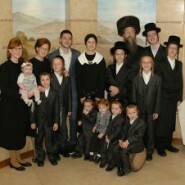 But I feel like having all these kids is 14 times the work, but a million times the nachas. People say that as mother of a large family you can lose yourself, but my experience has been the opposite. I feel like I’ve become more in touch with myself and who I really am– a queen, and a daughter of the highest King. And that hard-won understanding is yet another one of the great gifts my children have given me. B”H, I will be reading this many times. I am overawed by the simple truth and depth of these beautiful words, written by a very, very special mother and woman. I know, somehow, that she is speaking about me too, but I haven’t come even close to encountering that side of myself yet. I really, really yearn someday to be able to read this, and, finally, recognize myself somewhere in between those lines of wisdom. Thank you for a truly inspiring post. Wow. What a deeply inspiring piece. I think the most inspiring thing about the holy rebbetzin’s words is that she makes this task out to be something any Jewish mother can do. I especially felt relieved reading what she said about being more anxious and having lower self-esteem as a younger mother with fewer children. It helps to know that we can learn how to be calmer and happier as we go along, and that stress doesn’t increase exponentially with every child Hashem blesses us with. After all, stress is our own reaction, and as we grow we gain more tools to stay calm and happy amid the pressure. Thank you Chana Jenny and thank you Rebbetzin Nivin for these precious words. Like the commenter above me I will be rereading them many times. As I was reading this blog, I heard rustling noises coming from outside the bedroom of my just-put-to-bed children. I had just got to the part about connecting with an inner sense of malchus, when a small plastic object came plummeting down the stairs. I called up, ‘Go to bed please. Stop messing around,’ and continued in a similar vein for a while with no response save for an increase in rustling. I considered shouting a few threats up the stairs, but as I was in the middle of reading a blog about a calm and collected mother, I decided to see if I could gather my own sense of inner malchus on my way up the stairs to deal with them in a queenly and winning manner. I heaved my belly from the couch. Not feeling so dignified. Pulled myself up the stairs and stood panting regally at the top. Perhaps not so regally. And of course, the errant child had been alerted by then and was in bed, where I discovered her, sitting guiltily clutching a pen and some papers. After whispered negotiations I pulled them from reluctant hands and put them out of reach. Went back downstairs and leaned over and picked up some toys and dirty socks on the way back to the living room to write my blog. I can’t imagine Princess Catherine doing this. So my question really is, what is an inner sense of malchus? Because clearly, I don’t quite know what I was expecting. How funny- before I replied or read the replies I was going to print this peice so I could have it in front of me at witching hour…or just for pure inspiration- I know from seeing a few moms with 7 or more children that it ironically gets easier when the numbers go up, with Hashems help of course because the more we depend on Him the more He is there- period. I think the fact that the rebetzin called these “commandments” is because we have to abide by them even when we dont feel like they are a reality within the daily grind- so for ds- I hear you but its work, the connecting to malchus is work beyond the routine mess work…but it is definitely achievable. Also, Chana, is it possible to get the remaining 8 commandments from Ayala? As a mother of seven, I have a small family by comparison, and it was so helpful to have the royalty uncovered in my heart again… to have the reminder of our special status… of how greatly favored we are. I am so encouraged, and this encouragement could not have come at a better time. The rest of the world may see royalty as a reason to not deal with the mudane, what it means to me is that as I do the many tasks we mothers have, small or large, humble or elevating, we do it with the knowledge that we are doing the most important work that we can be doing. Thank you so much! Wow – this was AMAZING. Thank you for writing this post! how amazing that rebbetzin nivin is speaking about jewishmom malchus – royalty – in the omer week of royalty! This is such an inspiring and candid article! Thank you!! What an amazing article. As mothers we do often forget the importance of our holy duty…to care for the most precious, priceless things in the world. As women, we have so many roles these days: caregiver, maid, cook, spouse, and also working for many of us. It’s so inspiring and crucial to keep our intentions focused that our whole goal is to bring Hashem’s beauty into the world through our children and love them and give to them…the pieces. Thanks for sharing Chana Jenny! This was a very inspiring article. Much chassidishe nachas on the occasion of your son’s bar mitzvah and may you only enjoy nachas from the entire family. Thanks for sharing. This piece came on just the right day- what a morning I had of tantrum after tantrum- even 4 hours laters I feel like I have whiplash! I will continue to reread this until I can internalize some of the malchut that exists within Rebbetzin Nivin. Gut Shabbos! I loved this article, it is absolutely beautiful and inspiring…it’s important I’ve learned to remember that we are working to fulfill Hashems commandments and Hashem will provide us in return with nachas from our children. Really thank you To Chana and the rebetzin. AMAZING!!! Thank You for taking the time out of your very busy life to write this for all of us who need the inspiration. Thanks to CJ, I’m taking Rabbi Nivin’s chabura course, B”H. When Rabbi Nivin shared that one of his life’s purposes was to restore glory to the Nivin name, I now understand what he meant by that. Behind every great man stands a great woman – so nice to have the opportunity to learn from Mrs. Nivin too! You make it look easy but I know it is a ton of work. My aunt has 14 children and knyh it took all her time and strength, But she has great kids, all thriving and well bh. Like I’m sure yours will. Beautiful! Lots of Nachas! This article and others like it are the reasons I still use the internet! Thank you for sharing such a special piece on your website and looking forward to more like it. It is heart warming, refreshing, uplifting and inspiring! And what Jeish mom can’t use that once in a while?!? Thank you to the Rebbetzin. Your words of advice and inspiration are worth reading over and over. This is a very inspiring article, but I find myself wondering (as I take a short breather from caring for my 14 month and 1 month old daughters) – exactly how am I supposed to connect with my inner malchus? Between waking up every two hours at night to feed the newborn, changing diapers constantly and making sure to give each child her proper attention, I barely have time to put on my mitpachat in the morning, let alone embrace the feeling of royalty. “Don’t seat the small stuff” is a great practical tip and one I will try to keep in mind – are there any practical tips for feelings royal? Beautiful, inspiring and so true. This post gives me so much koyches! It is commendable and inspiring. However I have to note that the support the Hassidim receive from the government makes this large family possible, nobody has to actually work. I would love to have more children, but I can not afford it, and my children WILL have to serve in IDF. Ayala’s husband, Rabbi Aryeh Nivin, works very long hours as a life coach and teacher in order to support his family. 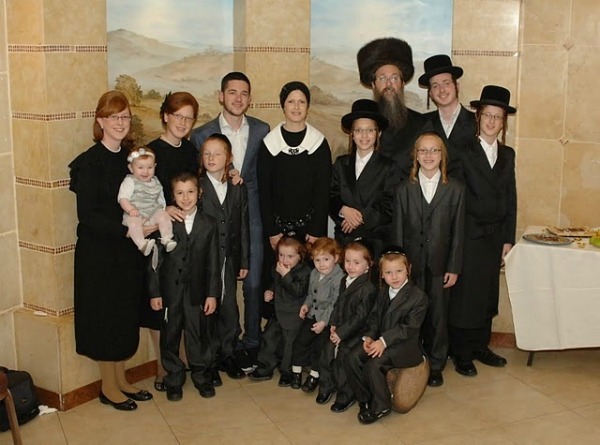 I noticed that one of the Nivin boys is not wearing the full Hassidic garb, yet he is surrounded by his family, and looks happy to be there, which implies that the family accepts him and his differences, and he still gets along with his family as well. What a beautiful lesson for every Jewish mother and father. This is inspiring and refreshing to me. I’m pregnant with our eighth and the rest of our family doesn’t understand our desire for a large family. I’ve kept the last 4 pregnancies a secret to avoid the remarks. Then I come to a website like this and I am refreshed and surrounded by like minded Jewish moms. I feel like royalty and am serving my King by taking care of what He has given me. May HaShem bless you and keep you!